2018 is an exciting year for my beautiful nation, Rwanda, and for travelers around the world. 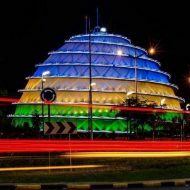 As a proud Rwandan, I am very happy that we are finally starting to get the recognition we deserve by many international tourism agencies around the World. As we start this year, Rwanda has been featured as one of the best places to travel to in 2018. This article will give you a brief introduction to Rwanda and explain why we have been recognized highly. Hope you add Rwanda to your wish list. RWANDA is a beautiful country in the East African Region. It is a landlocked country situated between DRC ( Democratic Republic of Congo) in the West, Uganda in the north, Tanzania in the East and Burundi in the south. Despite its horrible past history of 1994 genocide against Tutsi, Rwanda is moving forward together, stronger and faster than anybody envisioned. Today, 24 years after 1994, Rwanda is definitely nothing like the movie “Hotel-Rwanda” or ” Sometimes in April”. We are a peaceful, developing country, with the ambition to change the course of its history for the better. This is why international travel agencies such as CNN Travel, New York Times, Huffington Post, The Telegraph, the Vogue, and many others have featured Rwanda among the “must see” locations for 2018. Bear with me as I introduce you to my beautiful home country of Rwanda. Kigali has been voted as the cleanest and one of the most organized cities in Africa. In 2017, The United Nations nominated Kigali as the most beautiful city in Africa. The use of plastic bags was banned in 2008. Literally, no plastic bag is allowed to enter Rwanda. Even at the airport, you give up your plastic bags, and they give you biodegradable or reusable paper bag. It is amazing! Check out this British journalist story at the Rwandan Airport ( Credit: The Guardian UK). It’s called Umuganda in the local language, which means “ working together”. The last Saturday of the month, each community delegates a place to meet up and do something positive to the community. Usually, activities involve cleaning up, planting out trees, building a house for the poor, infrastructure ( a local school, hospital), or something of that nature. The idea is to work together for the betterment of the community and the Rwandan society at large. See this man in the photo above? Yes, he is the president of Rwanda. He does the Umuganda too. In fact, every month, he goes to different locations around the country to do Umuganda with the people. 4. Paul Kagame, the best president in Africa, right now. I can’t think of any other president who has transformed his/her country, literally from being hopeless to hopeful, from a disaster to an economic recovery, from literally nothing to something. Perhaps, most importantly, he has inspired and motivated the next generation of young leaders, like myself. He leads by example. He does talk less, but he does so much. A complete opposite of many African leaders. The man of action, himself! He just got elected to another 7-year term. 5. The most number of women in the parliament in the World. 64% of the members of the Rwandan parliament in both chambers ( Senate and deputy) are women. No wonder why the country is doing well. Regulations mandates that at least 30% of all government institutions have to be women. From top-level ministers level to low-level leaders in the communities. You talk about women’s rights, equality and all that? In Rwanda, we don’t just preach equality. We are doers. The population is 50% men, 50% women, so it makes sense to include women at all levels of decision making in the government. Doesn’t it? 64% of Rwandan parliament members are women. See this photo below? All women flight crew, Captain and her co-pilot of the RwandAir, the national air carrier and the Minister of Foreign Affairs. Very rare to see elsewhere, but not in Rwanda. Captain and her co-pilot, posing for a photo opportunity with the Minister of Foreign Affairs. Every year, Rwandan coffee wins some of the best international awards for best quality coffee. You can order you some here if you are interested. Let me know if you have had any other coffee that competes with ours. I am a coffee stud myself. So, I would be interested to know who are our competitors! 7. Kigali Convention Center ( The most expensive building on the African continent). It cost about 300 million USD. It is a masterpiece of architecture combining arts, culture, and modern design together. it is a major venue for big national and international meetings and assemblies. It has hosted African Union meetings, the World Economic forums, and many more. 8. Regardless of your nationality, you do not need a visa to come to RWANDA. Starting January 2018, you don’t need to apply for a visa to come to RWANDA. Want to come to Rwanda? No problem. You will get a 90-day visa at all Rwandan borders and airports if you are African; and 30–60 days if you are from other continents. Other countries are closing, tightening up their borders, we are opening them and welcoming the world. I love it. Rwanda has 50% of all the mountain gorillas in the world. They are endangered species, so Rwanda does a great job at preserving these treasures. You will have the best experience touring and visiting the amazing creatures.This is my cousin photo last time we were there. Amazing experience! My cousin, posing nearby ( 1 meter away) a gorilla and her two babies in the back at Virunga National Park. Also, if you want to see all sorts of animals ( Hippos, Lions, Zebras, etc) at their natural habitat, Rwanda has all you need. Akagera National Park and Nyungwe National Park are the main ones. Forget about the zoos, come to Rwanda. We will take you where they live. Rwanda is a very welcoming country. We have a rich culture of dance, music, arts and all that. There is nothing we enjoy more than sharing our culture with others. If you come visit us, we will be happy to share it with you. Below are a few photos of our sisters showcasing our amazing culture through dance and music. That’s all for now. I hope you learned something new about my country, Rwanda. Obviously, there are many facts about RWANDA, but this is a good introduction. If I get more likes, I will make another post. I will expand on arts, fashion, sports, economy, and other interesting facts about RWANDA. If you travel quite a bit, I hope I can convince you to add Rwanda to your wish list. Remember, no visa application! At your arrival, it costs $ 30 and takes between 3 to 5 minutes. CNN Travel just named Rwanda number 11 out of 18 best places to travel in 2018, so don’t miss out. Help me spread the word about what Rwanda is Today! Unfortunately, 8 out of 10 people I meet in the United States and Europe seem to assume that still 1994-RWANDA they watched the movie about the Rwandan genocide. They ask me: Have you seen the movie, “Hotel Rwanda”? Is that real? How is the country right now? Is your family safe/okay? Over the years, these kinds of questions get repetitive and annoying. This is why I am writing this piece to shed some light on false assumptions and stereotypes that seem to not go away despite all the progress that Rwandans have been making for the past 23 years. Help me spread the word and share this article with your friends. Let’s educate and inform the world about the new Rwanda by sharing one post at a time. Credit to Rwanda, the heart of Africa, facebook page for allowing me to use their pictures. For more pictures, check them out! Subscribe to my blog if you want to get a notification whenever I publish a new article. I pride myself to bring you good quality content. Did you take all the photos? I have asked permission to use them from their owner. Do you want to use them? Oh no just asking 🙂 it’s a great post! Reblogged this on Didier Champion.